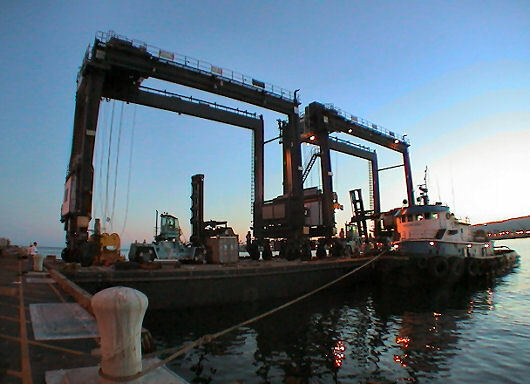 In June 2005, two ZPMC 40 LT rubber tire gantry (RTG) cranes and two Kalmar top pick container handlers were transported by the cargo barge EM 1105 from Long Beach, CA, to Tacoma, WA. For the relocation of this container terminal equipment, Argonautics Marine Engineering, Inc. was hired to provide the full naval architectural scope, including the structural analysis of the cargo. Because of the very short lead time, the project was fast tracked and the seafastening arrangement design was based on readily available materials. The shop drawings and supporting engineering documents were delivered on schedule and within budget. Mid June, the units were safely rolled onto the small cargo barge at high water. After installation of the seafastenings, the barge was towed to Tacoma and the RTGs and top pick container handlers were successfully delivered to their new terminal. Photographs courtesy of Rigigng International. ■ Loading and offloading calculations.